I’m in love, I’m in love and I don’t care who knows it! I know I can be a bit overdramatic at times (okay, maybe a lot) … but it’s true …. I’m in love with this scrumptious Cinnamon Apple Breakfast Porridge! I can’t begin to tell you how much I’ve longed for a warm, creamy bowl of delicious porridge! Maybe you have too? Since oats are a big no-no for those of us living grain-free, the question was how to capture the flavor and texture of oats without the use of that classic porridge staple? Another secret to this unbelievably yummy grain-free breakfast porridge is sweet and fragrant bite-sized apples sautéed with a pinch of fresh ground nutmeg and the addition of chewy sweet raisins. The culmination of flavors creates the ultimate porridge experience – rich cinnamony-apple flavor delightfully paired with a creamy, oat-like chewy texture. Still, even with all these tempting descriptions … Maybe you’re feeling a little skeptical – wondering if this interesting concoction of healthy grain-free ingredients might actually be capable of filling that void in your heart that longs for a warm bowl of creamy oatmeal? It’s such a joy to be able to create delicious grain-free foods that capture the tastes and textures of favorite comfort foods, and even better is when they are SO good that even our family and friends eagerly enjoy them too! 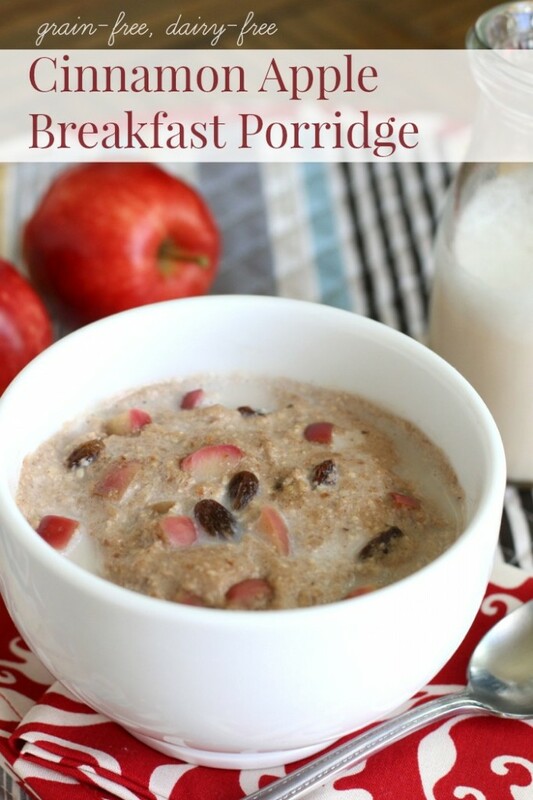 That’s why I’m SO excited to share this delightful Cinnamon Apple Breakfast Porridge with you. I’m beyond thrilled to be reunited with one of my ultimate wintertime favorites and I’m certain you and your family will be too! In a medium bowl, add the nuts and coconut flakes. Add enough filtered water to the bowl to completely cover the nuts and coconut. Add a pinch of salt and cover the bowl with a kitchen towel or plate. Allow the nuts to soak at least 7-8 hours or overnight. Once soaking time is completed, drain the nuts and coconut flakes in a colander; making sure to rinse them well until water runs clear. Add the nuts and coconut flakes to the bowl of a food processor. Then, add the egg yolk (if using) and banana (break the banana in pieces and add to the top of the nuts). Add ghee (or coconut oil) to a saucepan over medium heat. Add the chopped apple and nutmeg to the pan and sauté the apples until they begin to soften. Next, add the coconut milk, vanilla, cinnamon and raisins. Then add the banana-nut meal mixture. Stir well to thoroughly combine. Bring the porridge to a gentle simmer and cook for about 5-6 minutes until it's thick and creamy. 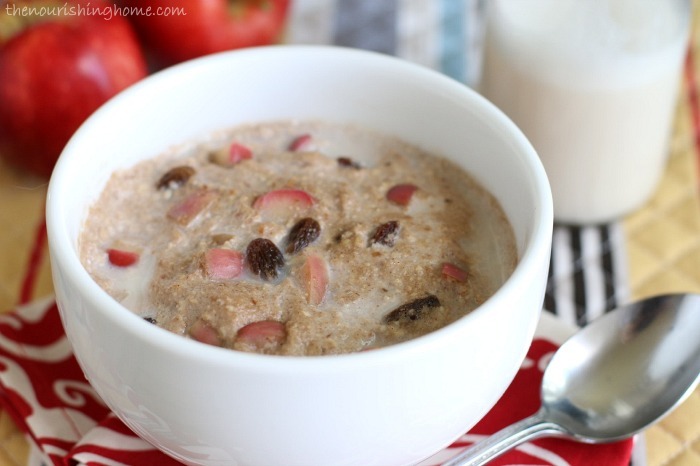 Ladle the cinnamon apple porridge into bowls and add a splash of your favorite milk. Truly the perfect breakfast to warm your family's hearts and tummies on cold fall and wintertime mornings. Love pumpkin pie? Be sure to try my scrumptious Grain-free Pumpkin Pie Breakfast Porridge too! Yum! Doing the Whole30? It's important to point out that technically speaking this isn't a Whole30-compliant breakfast since it mimics cereal. But you'll definitely want to add this to your reintroduction phase! P.S. The lovely table linens featured in these photos are courtesy of my friends at Hen House Linens. I just adore their beautiful linens, and even more so, their mission to make mealtimes special by adding a touch of warmth and beauty to the table. Kelly, this looks delicious and just perfect for the Whole30. I’m so tired of having the same old thing in the morning. I think my husband will love this. Thanks for sharing. My pleasure, sweet friend. I am so hooked on this I can’t even begin to tell you! 🙂 LOL! This looks so similar to hot cereal and I love the clever soaked nuts + banana trick – pinning this! Yum-O. Why haven’t I tried this yet? I have been cooking a couple of eggs with either spinach or sweet potatoes for most of my breakfasts, but I think I will give this a try SOON. Yum! I bet this smells fantastic in the morning! Does it keep you satisfied until lunch time? I’m not even doing the whole30, or grain-free, and want to lick my screen! 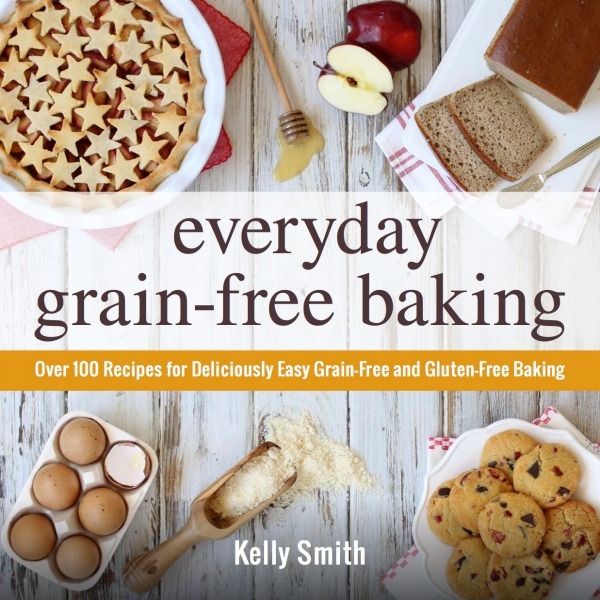 Kelly – this looks SO good! I’m adding the ingredients to my shopping list and putting this on my menu next week. Thank you for the delicious recipe! I was just wondering if Kelly or anyone has tried this with a whole egg? That way I wouldn’t have to throw out the white … but if it makes it unpleasant, I’ll just chuck the white. I might substitute homemade applesauce for the apple too, depending on how much time I have when I’m making this. Sounds delicious! Can’t wait! This looks and sounds yummy. Going to start my soak right now. This looks so good! I can’t have banana or egg (they are intolerances for me) but I may have to try it without those two. I have found something similar that I love though. I chop up an apple, sprinkle with cinnamon, and toss in some almonds, unsweetened coconut, and a few raisins. I’ve also made it warm by heating it up in a frying pan with some coconut oil- Yum! If you can’t have banana (which contributes sweetness and creaminess to the recipe) you can use more pumpkin, perhaps start with 1 cup for the amount. You still won’t get the same creaminess level, but it shouldn’t affect the flavor if you’re using maple syrup or honey to sweeten. As far as food processors, I definitely recommend investing in one, particularly for those who are eating a whole food lifestyle because they are so practical and can be used in so many ways, which is why you see me calling for this kitchen tool in so many recipes. I recommend either Cuisinart or KitchenAid. I started with a Cuisinart, which you’ll see in some of my older recipes and last year, I was gifted with a new KitchenAid which I really love. It’s this one:http://amzn.to/1Pqc9Lc but they also make smaller sizes for about half the cost. A 7-cup size would be the smallest I’d go if you’re looking for a food processor that can be used for multiple tasks. I am so excited to try it with the pumpkin puree! Thanks so much. Made this…soo so wonderful. I am a BIG oatmeal/hot cereal fan and this is just as wonderful as any! Thank you so much for sharing. It will be on my morning menu long after whole30 is over! I did also add a bit of flax, chia, hemp seeds for additional nutritional boost, same as I also do with regular oatmeal 🙂 What a powerhouse, wholesome recipe! There’s just something about a bowl of porridge that wraps you in warmth and your grain-free version with the apples and cinnamon sounds like the perfect way to start the day! This recipe turned out great! My 19 month old son even enjoyed it! We enjoy the paleo life, so I’m always on the lookout for good recipes. I appreciate all of the work that you do to keep us all healthy, Kelly! Stay blessed! My daughter is allergic to coconut. Is there a clean substitution to the can of coconut milk in this recipe and the pumpkin one? On day 5 of the whole 30 that I started with the New Year with my husband. We already tried the savory sweet potato hash and loved it and cannot wait to have this Saturday for breakfast. I was just telling my husband how much I missed oatmeal and now I can have this. Thank you for your wonderful creations! This looks so good! I am on day 35 of a Whole 60, and I’m eliminating nuts this half as I am questioning a nut intolerance :(. Do you think seeds could be substituted in the same amounts? I gave pumpkin, sunflower, chia, and hemp on hand. I’m so used to having nuts that I’m having a hard time figuring out substitutions! 🙁 Thanks in advance. You’re such a blessing! This looks great for after Whole30!!! Wow! During Whole30, recreating cereals/porridge with compliant ingredients is not allowed (per the SWYPO article) — can’t wait to try this!!! Did you ever find out if this was considered SWYPO if you are doing a whole30? I’d love to try this for breakfast as eggs are getting really a little dull. I made this with pecans instead of walnuts & omitted the vanilla (didn’t have any Whole30 compliant vanilla on hand) and it turned out AH-MAY-ZING!!!!! So good. And yes I know it’s SWYPO but as a rare treat, it’s very very nice 🙂 Can’t wait to try out the pumpkin pie version! And I know I’ll be making this after my Whole30 too! So glad you enjoyed this! It’s definitely a favorite of mine as well, especially in the winter when you just want a bowl of creamy yumminess! 🙂 Thanks for taking the time to leave a kind note! Best to you on your whole30! This looks so yummy! Is there a particular brand of vanilla that doesn’t include alcohol? I can’t find one (including the link in the recipe). This was absolutely sensational. I used dates instead of raisins and added cacao nibs. Thanks for sharing this! Love this porridge! In fact love it too much. I would eat it for all three meals a day! I’m just on day 7 of Whole 30 and I was not looking forward to an entire month of only eggs for breakfast. I’m sweet potatoed out, so the SP hash wasn’t working for me. I tried this and I LOVE it! Before Whole 30 my go-to breakfast was steel cut oats, and this is really very close to in between whole cut oats and cream of wheat, exactly as promised. I made enough for a few days, so I’m stoked that I will have a change. Thank you so much!!! LOVE this recipe! My sister made it as well, after I text her this link! Thank you for sharing!! From what I understand vanilla extract is not compliant, which is why we are suggested the vanilla bean powder. How much is in a serving? And do you know how many calories and fat are in one serving? I’m trying to lose weight and wondering if this is not a good option for that. Thank you! On day 7 of whole30 and I was already sick of eggs…so happy to have found this! Its delicious! I was just going to taste it when I was done as I was meal prepping for the week, but ended up eating a whole bowl! Thank you so much. I was surprised Whole30 people would say this was cheating. Oh well, I guess I’ll cheat and try it. I have vanilla powder that I ordered before starting Whole30 because I also cheat by putting ghee and coconut milk with vanilla powder in my coffee. A girl’s gotta do what a girl’s gotta do! Thank you! Made my first batch – sooooooo good! Thanks so much for this – I plan to use this again and again. I made this about 30 minutes ago and I was completely skeptical. I didn’t expect much enjoyment and thought it might be something I could tolerate, at best. Holy. Cow. There is no way anyone could tell apple cinnamon oatmeal apart from this lovely little imposter. My husband even liked it and he rarely likes this kind of food. I’m on my fourth Whole 30 and found this gem during a Google breakfast search. You are brilliant. Thank you for sharing your brilliance with us. This is so delicious! I’ve made it a few times now and love it. I’ve added 3 whole eggs to increase the protein and it works very well. I also added a chopped pear because I had one that was starting to ripen too quickly. That was yummy too. I feel like this recipe is versatile and is easy to get creative with it! Tried this this morning, was pretty impressed but the texture was grittier than I desired. However, I did use roasted nuts (because I didn’t know there was a difference before I bought them) and pecans instead of walnuts. Will using raw nuts change the texture to be more smooth? What’s the best way to reheat this for a quick breakfast? I forgot to soak my nuts last night but would like to make this tonight for the rest of the week. Could I boil them for ten minutes instead? I’ve seen and used this trick recently with cashews for a dip, but wasn’t sure if you knew about it or had thoughts. The cashews did not plump up when I boiled them like they do when soaked, but they did soften quite a bit and I was able to get them creamy in my food processor. Please let me know if you have any thoughts on this. Thank you! Heads up- cashews turned purple after 8hrs. Cashews only need to be soaked for 2hrs. Best recommendation is to soak the almonds and walnuts for 6hrs, then add the cashews. Do you know the nutritional facts on this dish? The serving size and calories etc. Although this was delicious, preparing it was the biggest cooking disaster I have ever had, and I’m a pretty good cook. I don’t own a heavy-duty food processor, so I tried to grind the soaked nuts in the blender. No dice. I tried a small food processor. Even worse. I had no idea it would take so long, and we had to go somewhere, so I had to scoop the whole mess into a bowl, as well as the pot with the cooked apples, coconut milk, etc., and put everything into the refrigerator until we got back. I finally had to cut up the soaked nuts with a knife. Again, it was delicious, but I am NOT making this again unless I can find all pre-ground nut meals to work with. You are absolutely correct, this is definitely a recipe that requires a food processor. I’m sorry to hear you had such trouble with it, but having the right equipment called for in a recipe is as important as using the correct ingredients to ensure a successful outcome. I’m glad you still enjoyed it. As far as your other note about vanilla extract and the Whole30 … As I noted in this recipe, this is NOT a Whole30 compliant recipe. I’ve tried to be as clear as possible about that in this post, but unfortunately, people pin and share this recipe (and others like it) constantly as a Whole30 breakfast option. Creating cereals of any kind, even if the ingredients in the cereal are compliant, is not permitted on Whole30. It’s obviously a delicious option for “Life After Whole30.” I hope this helps to clarify. Have a blessed Whole30! This recipe is delicious!! My husband loves it and I make it for him weekly. Love the nuttiness and yummy apples. Great texture. Perfect comforting breakfast! Thank you!! I never leave comments on recipe blogs but I just had to tell you I made this porridge this morning and I am ETERNALLY THANKFUL to you for creating such a warm, sweet breakfast option on my Whole30! Seriously, I took one bite and my eyes rolled back into my head. I’m in heaven. Thank you!